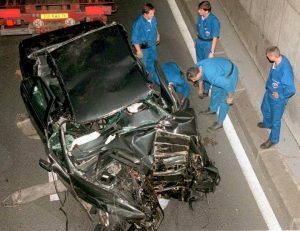 August 31, 2012, marked the 15-year anniversary of the death of Princess Diana of Wales after a motor vehicle crash in Paris, France. And while the mainstream press was busy re-visiting the salacious tales surrounding her death, Notes From The Go-Around was busy trying to doing what we like to do whenever a celebrity dies before their time – we re-visited the EMS system surrounding their death. In this case, we were re-acquainted with France’s Service d’Aide Médicale Urgente (SAMU) and the Franco-German EMS model, but ended up learning far more than we expected. Shortly after her death, the Paris Bureau Chief for TIME magazine co-authored a book, “Death of Princess: The Investigation” [ref], in which interviews with American and British physicians implied that perhaps the death could have been avoided, were it to have happened in the U.S. or UK, and not in France. In a not-so-subtly follow-up article entitled, “Death Of A Princess, Did Princess Diana Have To Die? : A Case Study In French Emergency Medicine”, Sancton wrote, “While not accusing any individual medical worker of professional errors in treating Diana – indeed, they clearly followed standard French procedures – Dr. Wasserman argues that the fault lies with the whole French approach to emergency medicine” – namely, a tendency for the “stay and play” approach to prehospital care common in physician-staffed ambulance services in the Franco-German model. IN any case, Sancton and MacLeod’s book, and Sancton’s follow-up article, was successful in eliciting strong reactions from all parties involved – French, British, and American physicians alike. In his article, “The Death of a Princess and the Formulation of Medical Competence”, Michael Nurok uses the 1997 death of Princess Diana as a launching point from where he presents emergency medical care as a societal undertaking that reflects the shared cultural and political experiences of an entire people – in this case, the experiences of the U.S.A. and France. “Paris SAMU physicians argue that because there is so little trauma in general – especially penetrating trauma – French surgeons are not as accustomed to its treatment as their American counterparts. [cross-ref] Taking patients to the nearest emergency department is similarly unfeasible because they are staffed by generalist physicians, who are no better equipped to handle serious trauma than their SAMU colleagues. For this reason, SAMU physicians are often forced to stabilise patients in MICUs while the base physician-regulator finds a trauma centre that can competently manage major trauma. Abstract: This study outlines a genealogy of the French and United States’ Emergency Medical Service (EMS) systems. This is done to contextualise claims that Princess Diana could have survived had her crash taken place in the USA, and to enrich the EMS debate regarding field-treatment vs. rapid hospital admission for trauma victims. A historical analysis is offered for the disproportionate amount of available data on penetrating trauma, and proportionate deficit of data on blunt trauma with respect to total North American and Western European trauma epidemiology. The impact of US biomedical knowledge and culture on French medical practice is evaluated and used to understand how foreign knowledge is negotiated in local medical practice. The paper concludes by showing how, in response to a challenge by American biomedical standards of practice and formulation of competence, French pre-hospital Emergency Physicians have contextualised the origins of these standards as well as their local relevance in order to preserve an integrated notion of competence. Jason is a paramedic by training and has been working in international development since 2003. Jason has spent many years living in Central America, the Caribbean, and Europe, working for a number of recognized international humanitarian organizations. Aside from ambulance operations and EMS management, he has also worked as a flight medic and paramedic instructor, a contributing author for EMS publications, and provides consulting for a range of global health initiatives in both systems development and disaster response.